Adarsh Palm Retreat Mayberry—situated in Marathahalli, Outer Ring Road—boasts of a neighbourhood that’s replete with the best amenities.The property’s strategic location not only ensures it is tucked away in tranquility but it also offers great connectivity via both Outer Ring Road and Sarjapur Road. 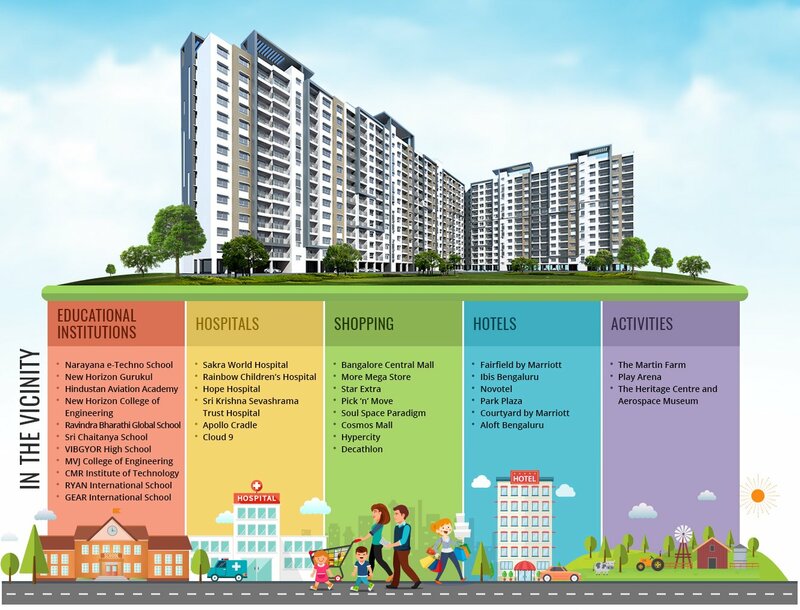 As a result, the locality is well connected to major business hubs like Electronic City, Silk Board, Koramangala and Whitefield. Also the proposed Peripheral Ring Road—passing through Sarjapur—links key arterial roads like Hosur Road, Old Madras Road and Bellary Road, thus opening new avenues of development in the region. Alongside, as per the third phase of Bengaluru Metro, construction on Metro lines connecting Yelahanka and Sarjapur has already begun. And because people always prefer a neighbourhood that is safe, well connected and offers great amenities, land value, rental returns and quality of life in the region has appreciated in the last few years. Buy Your Dream Apartment in Marathahalli—The Perfect IT Spot in Bengaluru! If you are looking for apartments for sale in Marathahalli Outer Ring Road, then you will find many projects both big and small. But what continues to make this locality a hotspot is its location. There are many apartments for sale in Marathahalli Outer Ring Road due to the strategic location of this area. The area is in close vicinity to Business Centres & IT Parks, best educational institutions, Leisure & Activity Centres, Shopping Malls, Restaurants and much more. This makes it ideal to stay in as all that an individual requires is just around the corner. There’s also a proposed Peripheral Ring Road in the works and in the third phase of Bengaluru Metro, the metro connectivity is also going to boost the property rates radically over the coming years. Owning a piece of property in this area is worth every penny, especially if you get a neighbourhood, which is in complete harmony with nature. Adarsh Palm Retreat Mayberry is right in the middle of such an ideal location spread across an area of 20 acres with both 2 and 3 BHK deluxe apartments. Doddakannelli is another very promising location in the neighbourhood that is located on the Outer Ring Road of Marathahalli, which is self-appreciating and adding a lot of value to the nearby locations. That said there are very limited options if you are searching for apartments in Doddakannelli. But in no time the location is expected to see a major influx of real estate investment, which will surge the property price here. Being in close proximity to Marathahalli still makes this destination a great place to buy a home at. From top schools like Ryan International and leading hospitals like Sakra World to malls like BangaloreCentral, you have right about everything a stone's throw away if you buy one of the apartments in Doddakannelli. For people looking for apartments near Embassy Tech Village, the perfect option would be Haralur and surrounding areas. The location offers easy access to everything and the capital value and rental returns keep getting better year after year. The Outer Ring Road area has two citywide famous breweries namely Big Brewsky and Hoot Café & Brewery at walking distance. This makes them the perfect leisure hangout place after a long and hard day at work. There are also various family activities destinations like The Martin Farm, Play Arena and The Heritage Centre and Aerospace Museum. The strategic location of apartments in Haralur Road makes them closer to top hotels like Fairfield by Marriott, Ibis Bengaluru, Aloft Bengaluru, Courtyard by Marriott, Park Plaza, Novotel, etc. When you buy one of the apartments near Embassy Tech Village, one can easily access Decathlon, Hypercity and Cosmos Mall that are in close vicinity. For your daily needs, you can visit More Mega Store, which is located nearby. World-renowned hospitals like Apollo and other known hospitals like Sri Krishna Sevashrama, and Trust Hospital are all nearby. Having hospitals in the vicinity ensures that your family gets timely treatment in case of emergencies. Renowned educational institutions like VIBGYOR High School and GEAR International School are close by and you even have engineering and technology colleges nearby. Living in one of the apartments in Haralur Road will ensure your children don’t waste more time commuting back and forth from their colleges and institutions.